Survival food can quickly go from the thing keeping you alive to the thing that does you in. No matter how desperate your situation is, you will want to avoid eating spoiled food at all costs. 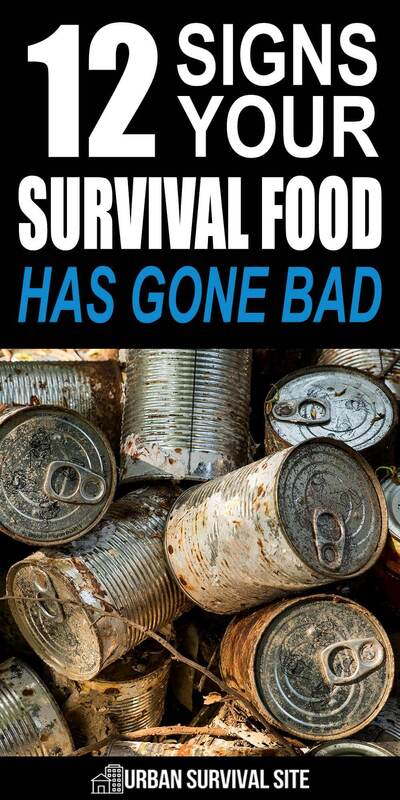 While good survival food is meant to have a long shelf life, there are many things that can destroy it. To ensure your stockpile is still safe to eat, be on the lookout for these signs that your survival food has gone bad. Canned foods have great a great shelf life, but they can still go bad. Fortunately, there are signs canned food has gone bad that you will be able to notice without even opening the can. When the bacterium known as botulinum begins to grow inside a can, it creates gases that cause pressure to build up inside the can. This pressure, in turn, can cause the lid to bulge. Botulism poisoning can be fatal, so avoid eating from any can that has a bulged lid. If food spews out when you open a can, it’s because there was pressure inside the can which, again, is a sign of botulinum. If a can spews or makes a loud hissing noise when you first open it, do not eat it. Note that some cans are vacuum sealed, so a small hissing noise when you open them is perfectly normal. But if it’s loud or forceful enough to eject anything from inside the can, then beware. If it smells off, don’t eat it. This rule applies to all types of food–canned, frozen, or stored in any other way. If it’s giving off a funky odor, then it just isn’t worth the risk. Rust on a can isn’t a direct sign of spoilage. However, it does increase the likelihood that spoilage will occur. If rust manages to eat through the metal and let air in, bacteria can get in as well. It’s best to not take the chance and avoid eating from cans that have started to rust. If a can has a small dent in it, it’s probably safe. But for dents that are deep enough to lay your finger into, you will want to discard the can. Unlike bulging cans, dents are not a sign that bacteria are present. However, large dents can damage the seam of a can, allowing bacteria to get inside. This one is simple enough. If the expiration date on your food has come and gone, it’s best to toss it. The people manufacturing these foods know what they are doing, and although expiration dates do tend to be a bit conservative, it’s still a good idea to pay attention to them. Also be sure to put the date on any foods you can or package yourself, and don’t forget to rotate. For bagged or boxed foods, bugs getting inside can be a real problem. If the presence of dead bugs inside your food isn’t enough to turn you off from eating it, consider the fact that if the bugs were able to get inside your food’s container, then bacteria is able to get inside it as well. Not only this, but there is also a chance that the bugs themselves are carrying diseases. It’s important, then, to store your bagged and boxed food in a place where bugs cannot bore through the packaging. You should also consider adding diatomaceous earth to your food. If your canned food has any kind of cloudy or slimy film on top, it’s a sign that it has spoiled. Often times, this film will also be accompanied by an off smell. But even if there is no odor present, the food should be discarded. This sign mostly applies to foods in glass jars that you or someone you know has canned. If the lid of the can pops back up when you push it down with your finger, it means the can never properly sealed. Storing food in cans that have not been properly sealed is essentially the same as storing food out in the open, so you will always want to be careful when you are canning and make sure the lids are sealing properly. If there is mold present on the underside of the lid when you open a can, throw it away. Even if there is no mold visible on the food itself, you can guarantee it is there. If there is any foam visible on top of the food when you open a can, you will definitely want to throw it away. Foam on top of the food is one of the main signs that the bacteria botulinum is present and, as we’ve already covered, botulism poisoning can be fatal. Though all signs of spoilage should be treated with seriousness, foam on top of canned food is a sign that should certainly not be ignored. If things are able to get out of the can, things can get in as well. If there is any sign on the outside of the can that food or liquid has leaked out, avoid eating it. Knowing the signs of food spoilage is important, and it may save your life. However, if you store your food properly, spoilage is much less of a concern. Make sure to take care when you are canning your own foods, and follow all necessary procedures. When storing food, make sure to keep it in a place where bugs and animals won’t be a problem. By sticking to good food storage practices, you should be able to make sure that the vast majority of your stored food stays safe to eat. By keeping an eye out for signs of spoilage, you will be able to ensure that, even if some of your food does go bad, it doesn’t end up costing you your life.